The National Writing Project is hosting Why I Write to increase the visibility of the power of writing through a national campaign on October 20. As a big proponent of expanding the concept of literacy, I’m supportive of any initiative that conceptualizes composition as the practice of using symbols (of all kinds, including language, images, graphic design, sound, music and interactivity) to create and share meaning. My big-picture vision about multimedia composition is paired with a substantial interest in helping students master the mechanics of writing. Word choice, grammar, organization and structure– all these skills come together when we write. In digital composition, a similar carefulness and precision enables us to create and share complex emotional nuance and deep ideas. Even as an experienced teacher, I continue to discover new strategies that help students learn how to manipulate symbols. These days, I’m quite taken with Gerald Graff’s and Cathy Birkenstein’s They Say, I Say: The Moves that Matter in Academic Writing. A well-organized essay or a well-turned sentence can thrill me, although that’s not the reason why I read or “why I write.” For me, reading and writing are far more prosaic: both are simply a means to support my thinking as I discover and share ideas. And even though I’m keen on all things multimedia, I reject the claim that online writing is a completely new discourse form. The idea simply revolts me: good writing is good writing is good writing. 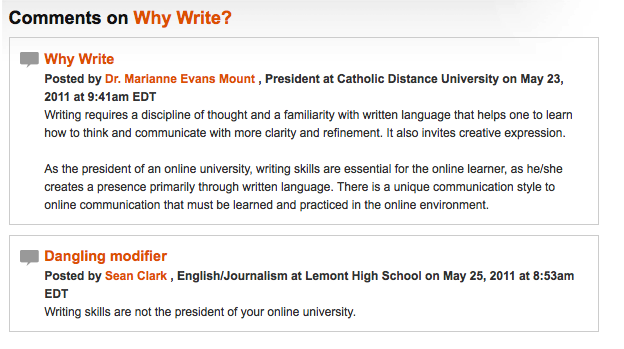 For these reasons, I was amused to find this set of comments at Inside Higher Education. Perhaps it’s inevitable that people will blather on quite sloppily about the importance of writing when posting online, with all the speed and ease it offers. Perhaps it’s just a little TOO easy to string together banal ideas about the value of writing. But there are some things to really treasure about online writing. For example, see below. How glorious when the dangling modifiers of a university president get corrected by a high school student!